I recently had 2 weeks holiday in Samoa with the intention of resting and doing a lot of reading and swimming (as physiotherapy for my neck). The first week was very restful, it was very hot and i spent a lot of time in the swimming pool and also did a bit of snorkeling on the reef. The second week, I volunteered to help at Tiapapata Arts Centre. I expected to just help with classes but was booked to teach one fabric printing class with kids and 3 adult classes (bookmaking, mono printing and natural dyeing) and to do a talk about my work. It was a great week, it got me started thinking about art again after all the focus on hospitals and my health. I found the heat very tiring in Samoa, as my body still can't cope with heat or cold very well. The thyroid deals with that sort of metabolic stuff and my medication isn't quite at the right level yet. Luckily the art centre is high up in the hills above Apia and much cooler which was great. 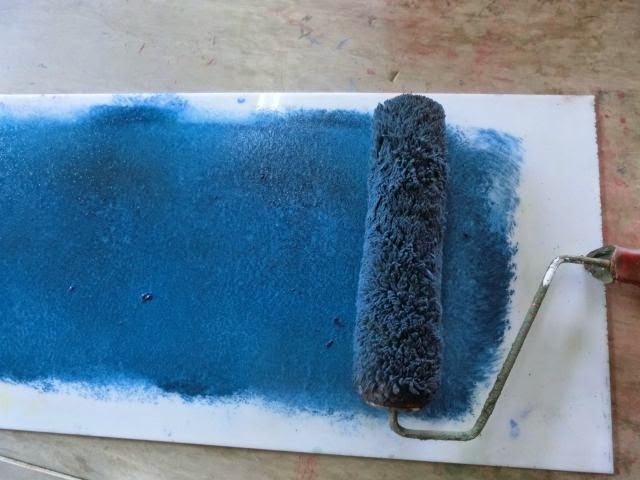 The art centre runs classes for children and adults , and has an Artist in Residence programme and occasional visiting artist/craftspeople as volunteers who help with classes. It also has 3 accommodation options if people want to stay, including a tree house and two flats. 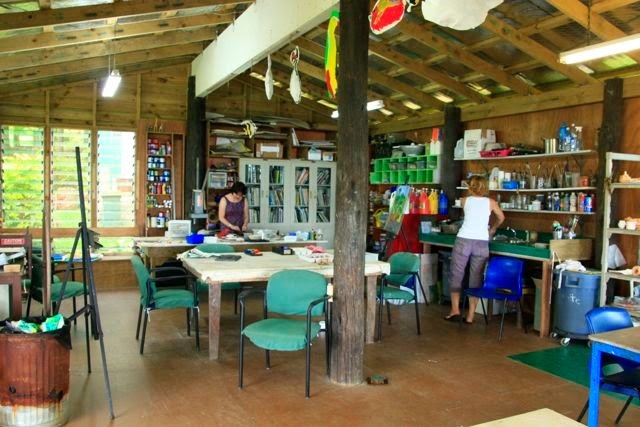 While I was there, the owners were preparing for an Art Therapy symposium which was held in the studio, with visiting speakers from Australia. 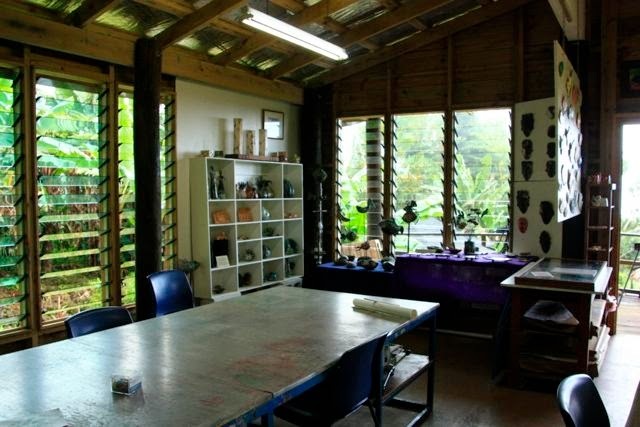 Here are some photos of the studio and grounds of Tiapapata arts centre. 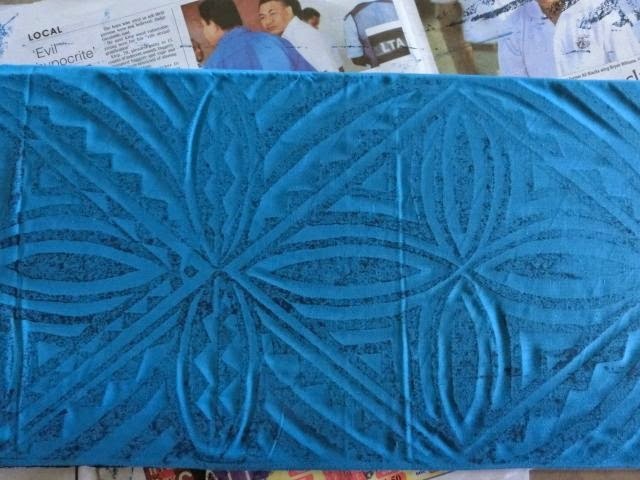 While I was at the workshop, one of ladies at my talk, showed me how to print using the wooden boards which used to be used for printing Tapa cloth but are now used for printing Elei fabric. Printed fabrics, showing repeat patterns. 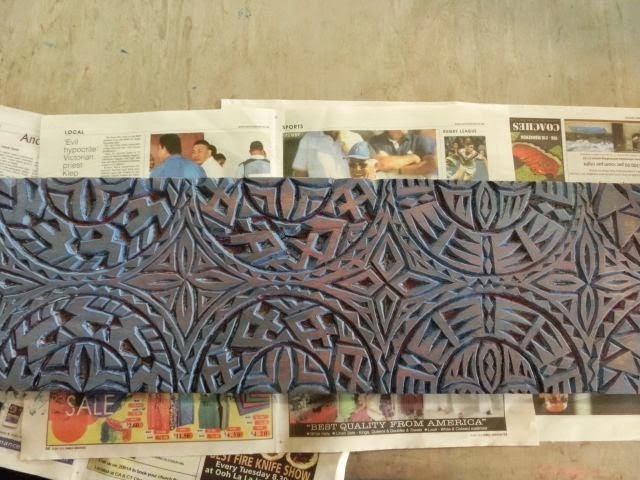 It is much harder to match up the pattern repeat than it is for screenprinting. It really needs two people and I was only moderately successful at it on my own. Luckily I tend to cut up my fabric and use it for patchwork or collage rather than in long dress lengths. 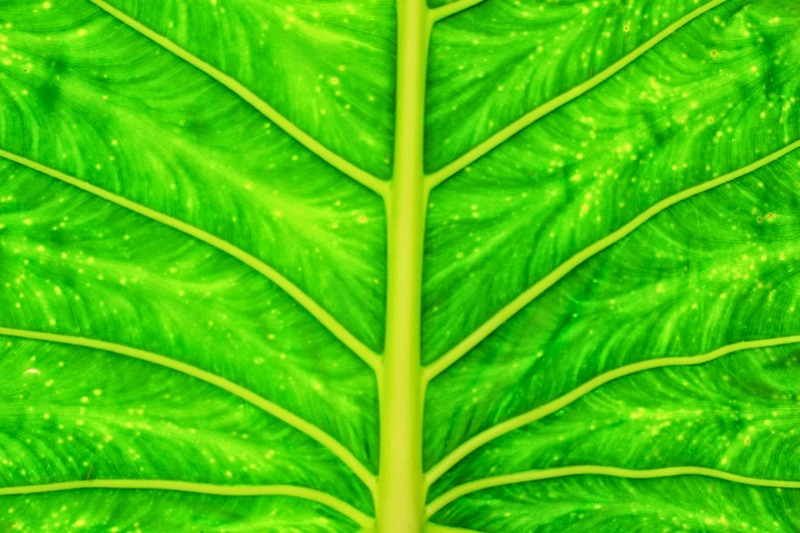 There is very little cotton fabric available in Apia, as most people prefer Polycotton. It doesn't absorb as much ink and prints very well, but I still prefer cotton if I can get it. Here are some fabrics I bought in Apia. 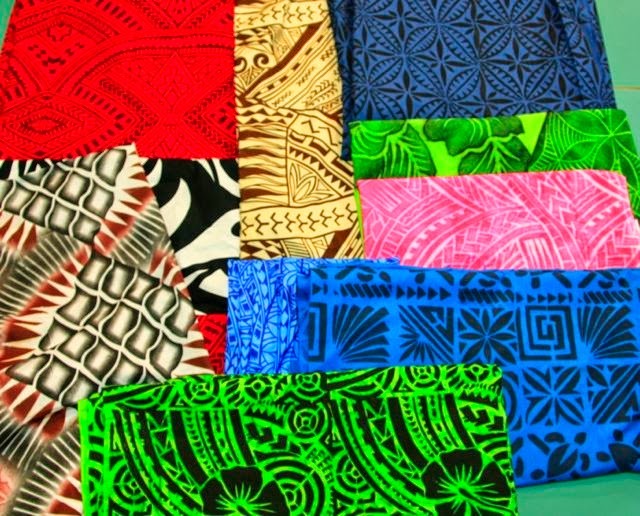 The main souvenirs in Apia are fabric lengths and wooden items. 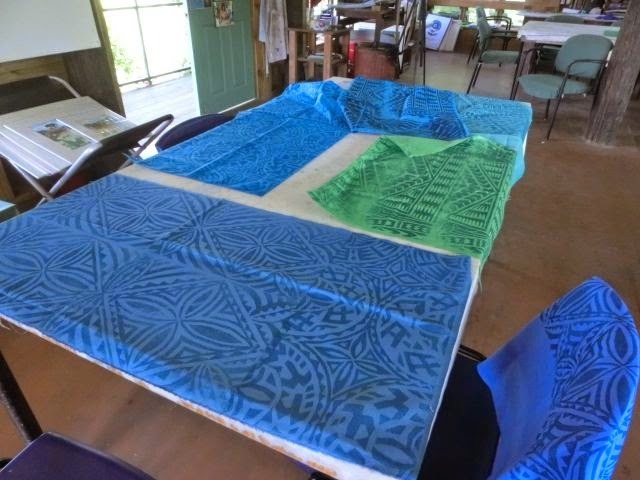 There are lots of hand printed fabrics using the Elei method above or screen printed. Most of the screen printing is done using a stencil made of old X-ray film on the back of the screen. 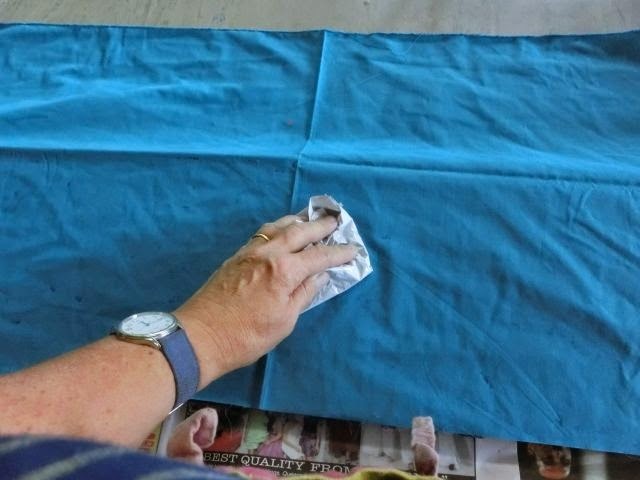 I've found this often makes a blob of ink as the squeegee goes over the cut edge, and I found signs of the 'blob' on lots of fabric lengths at the market. 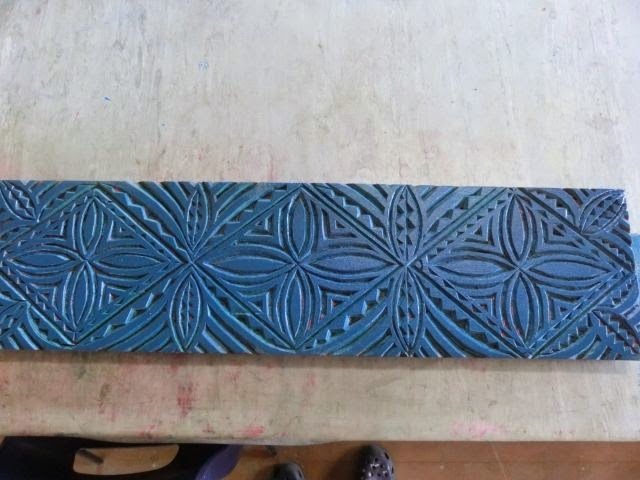 Its quite easy to see which fabrics have been screen printed and which have been rubbed on the carved boards. I bought 4 of the stencils made of X-ray film. They were 10-15 tala each (about NZ$5 -$7). They are beautifully accurate and I was told that they are often sold by students from the local art school. When I let school I trained as a radiographer so I was quite interested in the X-rays as they still have the name and left or right lead markers showing on them. I'm slowly sorting out my photos from the trip and hope to add more over the next few days.